Last year, all five of the first-year apprentices at Soil Born Farms’ headquarters near Sacramento, California were women. Another young woman, Elle Huftill-Balzer, was the boss of them all, the farm manager. “It [was] a total girl-power year around here,” says Janet Whalen Zeller, co-founder and co-director of Soil Born Farms Urban Agriculture and Education Project, which oversees two farms totaling 56 acres. In fact, during the past few years the majority of apprenticeship applicants at the farm have been women. Zeller isn’t a farmer. She is an educator and advocate with a vision of healthy food for all of Sacramento County’s 1.4 million residents. In 2004, she and two farmers turned Soil Born into a nonprofit organization to help urban residents connect with their local food system and to improve underserved communities’ access to organic produce. Zeller can’t really explain the girl-power phenomenon, or why Soil Born’s team is such a striking contrast to the demographic portrait of American farmers, which skews largely male. According to the U.S. Census of Agriculture, 86 percent of the 2.1 million people responsible for overseeing the day-to-day operations of this country’s farms are men. But wagering a guess, Zeller suggests that young women are probably becoming attracted to sustainable agriculture because of an interest in social justice and in curbing the harmful environmental practices of industrial-scale farming. “There seems to be a cellular call to tend the earth in a more sustainable way,” she says.The numbers seem to bear out Zeller’s theory. At the Center for Land-Based Learning in the rural town of Winters, California, 12 of the 20 students enrolled in last year’s seven-month California Farm Academy were women. This year, 7 out of the 14 confirmed participants are women. According to the U.S. Department of Agriculture’s Economic Research Service, woman-operated farms more than doubled between 1982 and 2007. About 14 percent of farms in the US are run by women today and women make up 30 percent of all U.S. farmers. The latest census data shows that women do, indeed, tend to follow more sustainable farming practices: They are more likely than men to operate farms with a diversity of crops and to sell food directly to consumers rather than to large food-processing corporations. Many of these women are part of a growing crop of new farmers–both men and women, between the ages of 25 and 34–who have taken to working the land in the past decade. They aren’t necessarily your typical young farmers, either. Many are college-educated and did not inherit farmland or come from a family of farmers, suggesting a more purposeful motivation for entering such a tough profession. Veteran Iowa farmer LaVon Griffieon sees this growing trend as an opportunity for women to break through what you could call the grass ceiling of yet another traditionally male-dominated profession. “There’s a real place for women in farming,” she says. “They are the nurturers and the persons [who] sustain the land.” Meet four women farmers in different parts of the country who are committed to growing food sustainably and humanely. 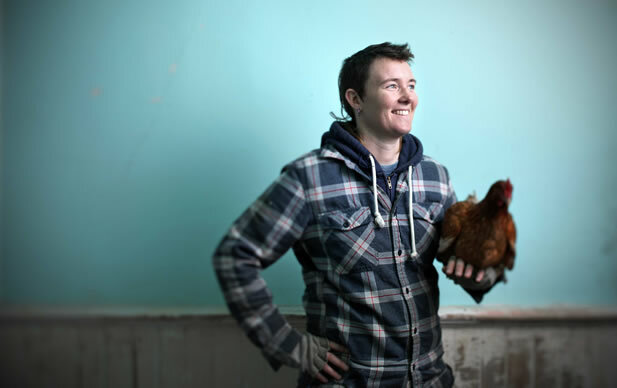 Lindsey Morris Carpenter is the owner-operator of Grassroots Farm, a certified-organic, 40-acre farm in Wisconsin. “It’s important to me to use sustainable methods because it’s the only ethically sound way to produce food that is safe, healthy, logistically practical, and most beneficial to our local, communal economy,” she says. After dropping out of a Philadelphia college in 2004, Carpenter worked on a vegetable farm in Wisconsin and then apprenticed at a bigger farm in Illinois. In 2007, she and her mother bought land in Green County, WI, which they leased while Carpenter worked on an urban farm in Chicago, teaching previously incarcerated people about growing food. In 2009, Grassroots Farm went into vegetable production. Today, her farm grows 75 varieties of fruits, vegetables, hops, and herbs. Grassroots Farm uses a closed-loop system in which farm wastes are recycled and fed back into the system to produce high-value agricultural products. The soil is fertilized by chicken and turkey manure. The cattle, lamb, and pigs are grass-fed and raised without antibiotics. Apart from vegetables, Carpenter also sells organic, free-range chicken eggs, a variety of meats, and pesticide-free cut flowers. Carpenter sells her produce at farmers’ markets and through her CSA program. Her other clients include a small group of local groceries and restaurants. She also offers work-share opportunities on her farm. “I do want there to be options so people can afford to eat this way,” she says. Carpenter feels strongly that organic produce should be accessible to people of all income brackets, but she struggles to balance making the food affordable and covering the costs of running a business. She does most of the farmwork herself. Paying laborers is simply too expensive. LaVon Griffieon’s four children–now adults and with degrees in agriculture–were the fifth generation to live in the house where her husband, Craig, was raised, and the sixth generation to live on the land north of Ankeny, Iowa. In an arrangement signaling the husband’s and wife’s differing views on farming, Craig runs the conventional cow/calf herd and beef-feeder operation while LaVon raises and direct-markets antibiotic-free and growth hormone-free beef, pork, poultry, and eggs. Her livestock eats non-GMO grain and corn. Griffieon Family Farm also raises soybeans, corn, oats, apples, and alfalfa. Raised on an 80-acre subsistence farm near the city of Spirit Lake in northwest Iowa, Griffieon has long been a vocal advocate of preserving prairieland from the threat of urban sprawl. “As I looked out my window I could see the northward march,” she says of the development growth in the 1990s. Subdivisions have since encroached on three sides of the family’s 1,120-acre spread. The group went on to form the Rural-Urban Stewardship Project and, later, 1000 Friends of Iowa, a nonprofit organization focused on promoting responsible land-use planning that protects farmland and natural resources and prevents poorly planned sprawl. It’s a constant battle. Griffieon has also served as an assistant soil commissioner in Polk County and has traveled to more than a dozen countries, including France, Belgium, the Netherlands, and Cuba to study sustainable agriculture. She’s involved with the Women, Food and Agriculture Network, an Iowa-based group whose ranks have swelled from about 300 members six years ago to nearly 5,000 from more than 25 states and several other countries today. Nelida Martinez grew up in Oaxaca, one of the poorest states in Mexico. She moved to the US with her husband after they got married, and went from one farmworker job to the next, following the growing season. She lived in California 11 years before moving north to Washington State to work for large corporate farms. “I got a lot of experience from the bigger companies during that time and learned a lot of really useful things, but I also saw some things I didn’t like,” Martinez says in Spanish. She witnessed the heavy application of pesticides, which pose a threat to human health and the environment and have been linked to some cancers, damaged nervous systems, and birth defects. When her own son began experiencing acute stomach problems, Martinez came to believe it was due to his persistent exposure to pesticides. She vowed that if she ever had the chance to run her own farm, she would forgo synthetic chemicals to kill weeds, insects, and other perceived pests. But owning a farm was a distant dream for Martinez. While census figures show that Hispanic-operated farms increased a significant 21 percent between 2007 and 2012, Hispanic women don’t even constitute 1 percent of all farmers in the US, and even fewer are principal operators. In 2009, Martinez connected with the nonprofit Viva Farms Incubator Program in Mount Vernon, Washington, which helps experienced farmworkers establish their own organic farms while minimizing prohibitive start-up costs. To sublease plots on the program’s 33-acre site, applicants must graduate from two 12-week courses – one on sustainable small farming and ranching and the other on entrepreneurship and business planning. Martinez started with a one-acre sublease, which has since grown to five acres. On her piece of land she grows kale, chard, peas, carrots, tomatoes, strawberries, tomatillos, chilies, Oaxacan herbs, and other produce to sell at the Viva Farms farm stand and to local restaurants. “I’m very passionate about planting here and watching plants grow from the seed through the harvest,” she says. Elle Huftill-Balzer often gets asked the same question when she tells someone she’s a farmer: “People still do that?” According to the Economic Research Service, hired farmworkers and farm managers comprise a mere 1 percent of the American workforce. Huftill-Balzer is proud to be among this rare breed. “I love growing things and seeing what I’ve done – it’s just at the end of the day [knowing] that you’re doing something worthwhile,” she says. Elle Huftill-Balzer is a farm manager for Soil Born Farms, a nonprofit organization with two urban farms near Sacramento, California. 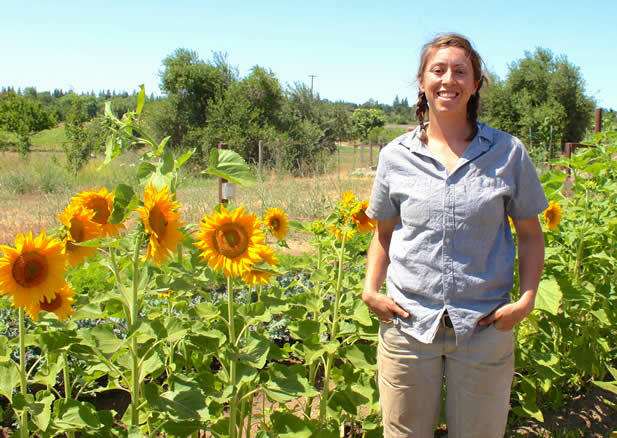 After earning a fine arts degree from Oregon State University and working an office job, Huftill-Balzer apprenticed at Soil Born Farms in Sacramento and graduated in the inaugural class of the California Farm Academy in 2012, running a half-acre incubator plot with a friend. She was hired as the manager at Soil Born Farms that year. At Soil Born, Huftill-Balzer sets the daily tasks, oversees quality control, manages restaurant accounts, and coordinates the CSA packs. The farm – surrounded by strip malls, fast-food chains, and homes – is certified organic, and Huftill-Balzer can’t imagine farming any other way. “It just feels like what you should be doing,” she says. Since she works for a nonprofit, Huftill-Balzer doesn’t worry about the farm’s income, which is a luxury not afforded most farmers. But she has plenty of other worries, including how she and her husband, a PhD candidate in ecology, will one day balance raising children with farming. This article originally appeared in Earth Island Journal. Photos credits, from top: Anthony Wahl, Marji Guyler-Alaniz, Cole Allen, Sena Christian. Civil Eats, March 6, 2015, by Sena Christian, a Ted Scripps Fellow in Environmental Journalism at the University of Colorado Boulder. Her work has appeared in Newsweek , Earth Island Journal, and YES! Magazine, among others.